Free Shipping Included! 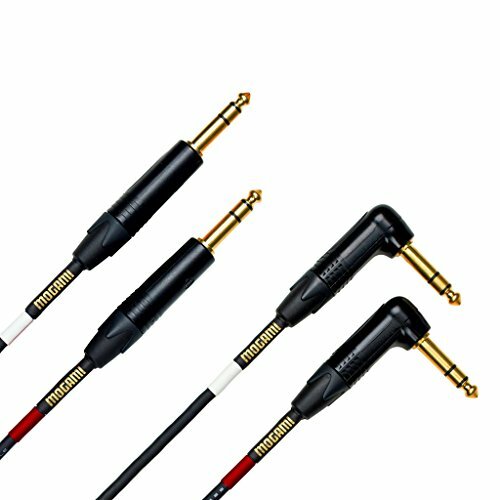 Mogami GOLD KEY SB-15R Balanced Stereo Keyboard Instrument Cable, 1/4'' TRS Male Plugs, Gold Contacts, Dual Right Angle to Dual Straight Connectors, 15 Foot by Mogami at Riot Recordings. MPN: GOLD KEY SB-15R. Hurry! Limited time offer. Offer valid only while supplies last. Mogami GOLD KEY SB-R Balanced Stereo Keyboard Instrument Cables harness the full benefits of balanced outputs found only on the finest keyboards. Mogami GOLD KEY SB-R Balanced Stereo Keyboard Instrument Cables harness the full benefits of balanced outputs found only on the finest keyboards. Exhibiting the highest detail, superior dynamics, and most accurate tone, Mogami GOLD KEY SB-R Keyboard Cables provide the widest bandwidth and quietest background. Wired with a single Mogami Stereo Microphone Cable equipped with dual twisted pair conductors, Mogami GOLD KEY SB-R Cables are constructed with oxygen-free copper (OFC) cores and Ultra High Density (UHD) spiral shields for the highest level of transparency and lowest noise floor. This low capacitance, balanced design is superb for the most dynamic and noise-free performance. Use Mogami GOLD KEY SB-R Balanced Stereo Keyboard Instrument Cables to connect the 1/4" TRS left/right outputs from your keyboard, organ, synthesizer, digital home piano, or other balanced stereo device to the 1/4" TRS left/right input jacks on your stereo amplifier, mixing board, powered speaker, or loudspeaker system. Mogami GOLD KEY SB-R Balanced Stereo Keyboard Instrument Cables are available in 6, 10, 15, and 20 foot lengths. Mogami Lifetime "No Excuses" Warranty: all brand new Mogami cables include Mogami's Limited Lifetime "No Excuses" Warranty to the original purchaser and are proudly supported by Mogami and their dedicated network of Authorized Resellers. Please reference the entirety of Mogami Cable's Limited Lifetime "No Excuses" Warranty specification for complete details. Mogami GOLD KEY SB-R Balanced Stereo Keyboard Instrument Cables harness the full benefits of balanced outputs found only on the finest keyboards. Exhibiting the highest detail, superior dynamics, and most accurate tone, Mogami GOLD KEY SB-R Keyboard Cables provide the widest bandwidth and quietest background. Wired with a single Mogami Stereo Microphone Cable equipped with dual twisted pair conductors, Mogami GOLD KEY SB-R Cables are constructed with oxygen-free copper (OFC) cores and Ultra High Density (UHD) spiral shields for the highest level of transparency and lowest noise floor. This low capacitance, balanced design is superb for the most dynamic and noise-free performance. Use Mogami GOLD KEY SB-R Balanced Stereo Keyboard Instrument Cables to connect the 1/4" TRS left/right outputs from your keyboard, organ, synthesizer, digital home piano, or other balanced stereo device to the 1/4" TRS left/right input jacks on your stereo amplifier, mixing board, powered speaker, or loudspeaker system. This Mogami GOLD KEY SB-15R Balanced Stereo Keyboard Instrument Cable is a 15 foot length. The Mogami GOLD KEY SB-R Balanced Stereo Keyboard Instrument Cable series is also available in 6, 10, and 20 foot lengths.